The tulip is my favorite flower. I wait all winter for the first signs of their tips to peek out from the ground. And when they finally bloom, with all their spectacular color, I can declare that spring is finally here. When I first began gardening about 20 years ago and planted my first crop of tulips in the fall, I wasn't sure what to expect. But it was an amazing feeling when I discovered their tips as I scratched through the dirt and mulch in early March. I still laugh about the year, still a novice gardener, when there was the threat of a hard freeze about the time most of my tulips were just beginning to bloom. Every bucket, box, container and blanket was put into emergency service as I fought to protect my tulips from the evil Jack Frost. My work seemed to pay off as my tulips survived unscathed. 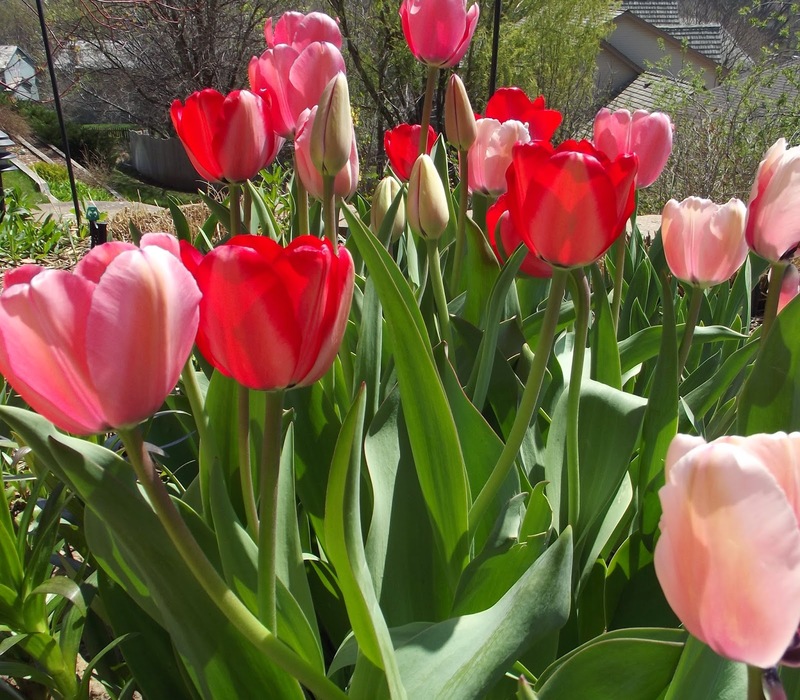 But several years later, we had a snow and ice event that came up unexpectedly and my tulips were left to fend on their own. 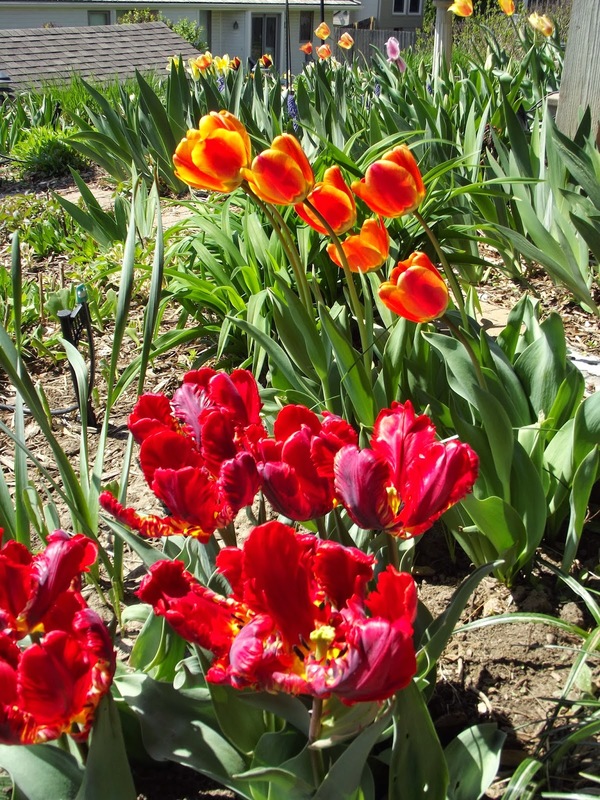 Much to my chagrin, they all survived without a hitch and the only damage was done to my pride since I was sure that there would be no tulips that year. Since then I've learned to trust Mother Nature and the forces of the earth that seem to be in charge more than I am. My secret, well, not really a secret , but my guarantee of having robust tulips every year is to pull their leaves as soon as they are done blooming leaving the bulbs to shrink away, and then plant a new crop every autumn. That way I get close to 100% blooms and I get to pick out new colors and varieties every year. Actually, when I worked over in the Netherlands, some of the Dutch folks I was chatting with about tulips told me that they treat the tulips an annual, more often then not. It's a little more expensive than if you let the leaves wilt for 6 weeks after blooming, but worth it when you get a robust bloom every spring. I may have to rethink that strategy when we go to a full retirement budget, but for now, we get a tulip bonanza every spring. Sometimes I wished the tulips lasted longer than they do...seems like we wait forever for them to appear and then in the blink of an eye, they are gone. But I know that the joy is in waiting through the grey cold winter, only to be delighted by the vibrant splash of color they provide to the spring landscape. So today, on this 12th of April, we are about halfway through the spring bulb season. 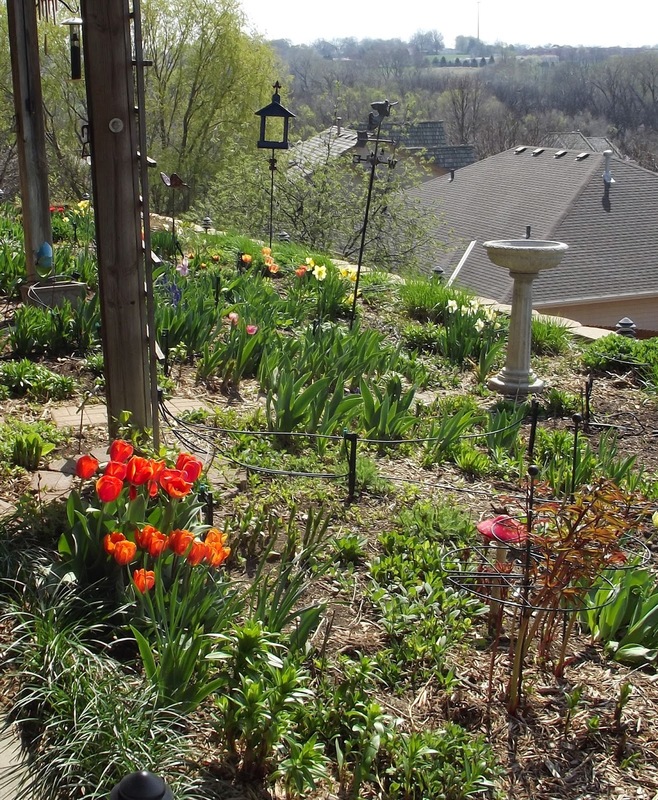 Just a couple of more weeks and the tulips, daffodils and hyacinths will give way to iris, peonies and the rush of perennials and summer annuals. Mother Nature never disappoints even if she makes us wait or teases us with a temperamental storm. And this year, like most years, she has once again blessed us with beautiful tulips.